We’ve just arrived in Lifou, and already we’re late for the royal wedding. This morning, the son and heir of the Chief of Gaïca is marrying a local girl, and the festivities have been going for about a month. Three thousand guests – about a third of the island’s population – have gathered in the town of Drueulu, which is festooned in flags and banners, and a festive spirit has overtaken the entire island. Everyone is talking about “la Mariage”. In Lifou’s capital, We, the supermarket’s butcher advertises whole sides of beef for 850F a kilo, a “Special du Mariage”. Men wander around with garlands of grasses around their heads or necks. A stranger gives me a beer-flavoured hug with a double-cheeked kiss “Bonjour”. A man with a head full of dreadlocks leans out of a car window and asks me on a date. 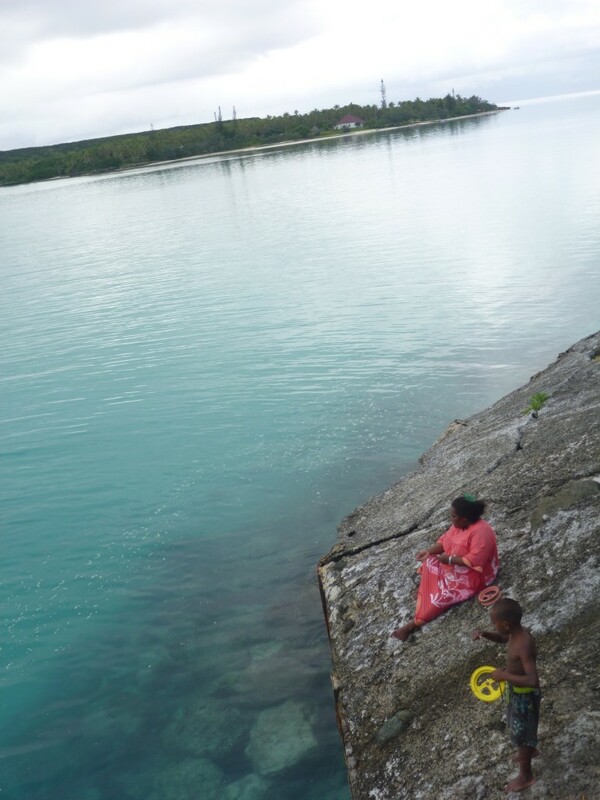 This is not a typical day in Lifou. Lifou is our second stop on a family holiday to New Caledonia’s Loyalty Islands. 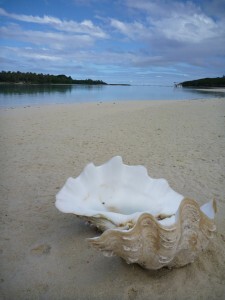 The largest and most populous of the Loyalty Islands, it is described by the tourism authority as “the island of many faces”. We like all of the faces we’ve met so far. 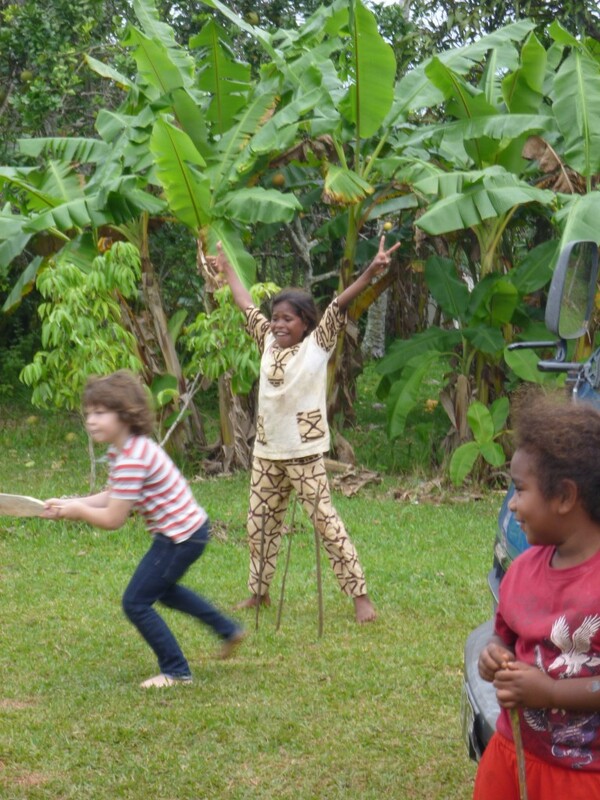 We’ve flown in from Mare (“the island that speaks to your heart”), where our five- and nearly seven- year old sons bonded with new friends over canoes and snorkelling, despite language barriers (French is an obvious advantage when travelling in New Caledonia). Mare is paradise served raw. A fifteen-minute snorkel straight off the shore reveals myriad reef fish, lovely wrasses, clams, varied corals, and a striped sea snake, New Caledonia’s endemic Tricot Raye, as well as a large school of hundreds of 15cm-long fish that flows past over a few hundred metres. Even in drizzling rain, visibility is adequate. The food at our hotel is patchy, and service varies from average-to-good, but with a setting like this, who cares? The boys are in heaven, spending hours racing canoes on a wide, safe lagoon, stopping only to exchange their paddles for face mask and fins. In Lifou a couple of days after the “La Mariage”, a misunderstood question about the location of some caves on a map (our French is woeful) leaves us standing in the middle of a tribu, or tribal village, near Wedrumel in the island’s southwest, surrounded by a makeshift junior cricket match. We are in the homestay of Jeanne Passil, who is due to return from the nearby caves, and we are invited to stay and wait for her. The boys are delighted, as they have already joined the batting side. We hang out, and chat, wandering through the tribe’s vanilla plantations, examining passionfruit vines and avocado trees. We poke our heads into the traditional Kanak case (a thatched hut), which is sturdy and comfortable and can sleep up to 12. When Jeanne returns with a couple of mud-splattered tourists from Noumea, the villagers offer to look after our sons while we go caving, which is an adults-only expedition. We decline, to the boys’ disappointment. They are on a batting roll. One of the village dads explains that the kids in this part of Lifou are mad for cricket, the game being introduced by protestant missionaries in the nineteenth century. Unlike the predominantly Catholic New Caledonia, a significant proportion of the Loyalty Islanders are protestant. As in many pacific nations, churches of both denominations dot the islands and are central to the communities. One decommissioned church worth visiting on the northwest of Lifou is the crumbly old Notre Dame des Lourdes, which reigns from her high point gazing down over two lovely bays, Jinek and Jokin. 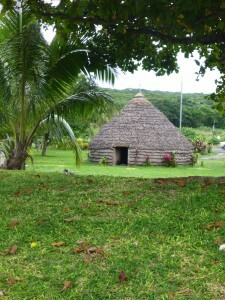 Tribal accommodation (accueils en tribu) is plentiful throughout the Loyalty Islands, particularly in Lifou. The traditional cases, the tall huts emblematic of these islands, are everywhere, and most tribes offer them as accommodation. They’re well signposted along main roads. 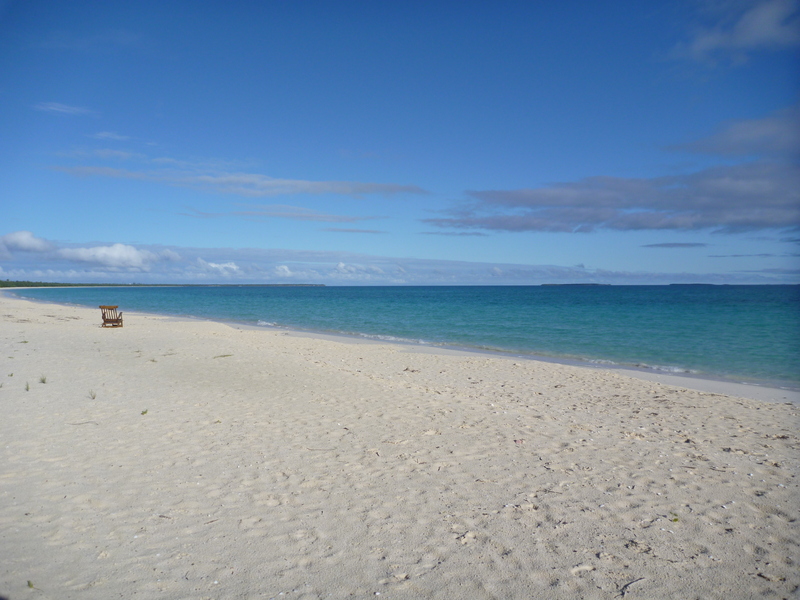 Lodging is basic, and comfortable, and usually in a location to die for, like “Chez Jeanne Forrest” or “Hukekep”, which huddle beneath coconut palms overlooking Luengoni beach, one of the most beautiful stretches of sand in New Caledonia. Or “Chez Benoît Bonua” in Easo in the northwest, a popular spot with divers. 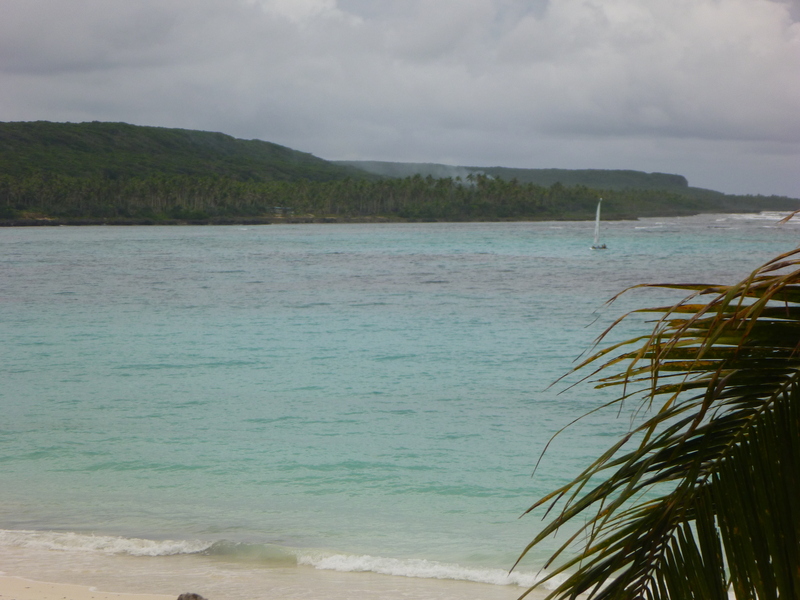 On our last day on the island, the boys are keen to sail, and we book a Hobie Cat to traverse Chateaubriand Bay, Lifou’s longest beach. The bay is wide and safe, and the reef is a long way out, but none of this matters as the wind that was blowing a gale in the morning has dropped to a baby’s breath by the afternoon, and the cat limps along at not-quite walking pace. What a little thumbnail of gorgeousness is Ouvéa. A tropical crescent, a lengthy slice of pure white sand, a string of palm trees. A lagoon stretching calmly out to a string of atolls, the Pléiades. If there was one single argument I could present to encourage the reduction of carbon emissions, this is it: the world-heritage listed atoll of Ouvéa. It’s about 35 km long, and although the cliffs that flank Ouvéa’s east are nearly 50m high, most of the island would disappear under rising sea levels greater than a metre. And that would be quite a shame. A brief walk along the beach ticks all the boxes. Starfish? Check. Sea snake? Dolphin? Cute hermit crabs? Check, check, check. We gaze into crystal depths from Mouli bridge, as spotted rays glide over coral bombies below. We feast on the freshest prawns and crab with papaya salad at Snack Fassy, a popular roadside restaurant with sand floors and woven walls. Ouvéa is so peacefully beautiful it’s difficult to believe this is the island on which New Caledonia’s pro-independence leaders, Jean-Marie Tjibaou and Yeiwene Yeiwene, were assassinated in 1989. We would like to visit the south Pléiades, and in the morning a small boat pulls up to the beach outside our room. On board already are a young French couple, a French family of three, and two Kanak guides. We skim across the lagoon to the second island in the chain, Gee, a fair-sized limestone outcrop surrounded by reef. Our guides take us to the pristine white sand beach, walk back to the boat, and are gone. We are alone to explore. The boys soon name the island “Hermit Crab Island” as a moment’s still observation reveals that all those lovely shells dotting the beach are inhabited by the cutest of crustaceans. Hermit crabs have such a comical rolling walk; the boys love them. Caves wait to be discovered at either end of the beach – cool limestone overhangs with nooks and crannies and holes in the roof where tree roots drop through. We discover secret paths leading into the island’s interior. In the forest, we listen to the calls of the atoll’s birds, and examine mushrooms and lichen. I climb the limestone cliffs and look back across the lagoon to the low-slung crescent of Ouvéa. Below me are coral bommies, fish, starfish, and sea cucumbers. We are on a little atoll, off the coast of a bigger atoll, of the northeast coast of a large island, off the coast of our own large island, and there is so much to do! We’ve barely snorkelled, and the boys are busy with gentle hermit crab races, so we don’t notice the morning pass. Soon our guides return. They’ve been elsewhere on the reef, catching our lunch, and unload an esky on the shore: ten gorgeous reef fish, ranging from 50 to 120cm long. A table is unfolded in the shade on the beach. Beer, water, softdrinks, and biscuits appear. A fire is lit on the cliff, our fish filleted and wrapped in foil with garlic and soy, then cooked in the coals. We eat, toes in the sand, looking across the reef to the neighbouring atoll. My normally picky sons demolish their generous serves of fish and rice. Sadly, the other members of our party decided to souvenir a pair of spider shells (lambis truncata) from the reef. Each shell is twice the size of a man’s hand, and the animal inside curls out seeking water, finding only sand where it has been left to dry out on the beach. It is heartbreaking to watch. Yes, even with a belly full of freshly-killed reef fish. My French is not sufficient (and I don’t speak either of Ouvea’s native languages, Iääi or Faga-uvea) to ask our guides about how they feel about seeing tourists take such liberties with the fauna of their heritage-listed lagoon. The tide has ceded so much that when it’s time to go, we must carefully walk around the coral back out to the boat. Our guides have a surprise in store. They take us across to the next island, Gece. Here, the boat turns a lazy circle beneath sharp cliffs, where the water drops to a deeper, colder blue beneath us. Then, we see a grey flash. And another: reef sharks. Our guides throw the fish heads and frames over the side of the boat, and more sharks flash by, fins breaking the surface like a surfer’s nightmare. There are at least a dozen, up to two metres long. I never realised a feeding frenzy could look so elegant. Air Caledonie flies daily from Magenta airport, Noumea, to Mare, Lifou, and Ouvea. International tourists may be eligible for a four-flight air pass at a discounted rate. The Hotel Nengone Village in Mare is situated adjacent to a divine white sand beach with excellent snorkeling, comfortable rooms, vintage pool, and free Wi-Fi in the lobby. The same company operates the 3-star Drehu Village Hotel in Lifou, which also boasts comfortable bungalows facing a white-sand beach, neat pool, and restaurant overlooking the ocean. For sheer glamour it’s hard to beat Paradise d’Ouvea, a 4-star slice of heaven at Mouli, Ouvea. Tribal homestays and gites are available on each island. Most offer accommodation in a traditional case. Simple local meals are also often provided. Kayaks, windsurfers, and Hobie Cats are available for hire from Centre d’Animation Nautique Hnaipole, in Chateaubriand Bay. French is spoken throughout New Caledonia. Indigenous languages Nengone and Drehu are also spoken on Mare and Lifou respectively, and Ouvea has two local languages, Iääi and Faga-uvea.